Plowing through the solar system's unexplored frontier, NASA's Voyager 1 spacecraft has entered a region of stagnant solar wind and magnetic pressure and is on the precipice of crossing over into interstellar space, scientists said Monday. But estimates for when the nuclear-powered probe will break through are not precise. Ed Stone, Voyager's project scientist, said it could be any time between a few months and a few years from now. "I can almost assure you that will be confused when this first happens because this will not be simple," Stone said. "Nature tends to be much more creative than our own minds." Moving around the perimeter of the Milky Way galaxy, the sun generates a wind of charged particles moving out in all directions. Ahead of the sun, the solar wind is compressed like the waves in front of a moving ship by a steady flow of plasma emanating from outside the solar system. The solar particles are mostly diverted down and up, then behind the sun like a ship's wake or a comet's tail. The region of the sun's influence, in which the solar wind is dominant, is called the heliosphere. The heliopause is the boundary between the heliosphere and interstellar space. No spacecraft has ever left the solar system before, so Voyager 1 is flying through an uncharted void between the influence of the sun and the interstellar wind, which blows waves of plasma and charged particles at a clip of up to 15 miles per second. "That transition may not be instantaneous," Stone said. "It may take us months to get through a rather messy interface between these two winds." The latest data from Voyager 1 show the spacecraft is in a region of stagnation, where the stream of charged particles from the sun has slowed and the sun's magnetic field has piled up, researchers said at the American Geophysical Union's fall meeting in San Francisco. "We've been using the flow of energetic charged particles at Voyager 1 as a kind of wind sock to estimate the solar wind velocity," said Rob Decker, a co-investigator for Voyager's low-energy charged particle instrument at the Johns Hopkins University Applied Physics Laboratory. "We've found that the wind speeds are low in this region and gust erratically. For the first time, the wind even blows back at us. We are evidently traveling in completely new territory. Scientists had suggested previously that there might be a stagnation layer, but we weren't sure it existed until now." 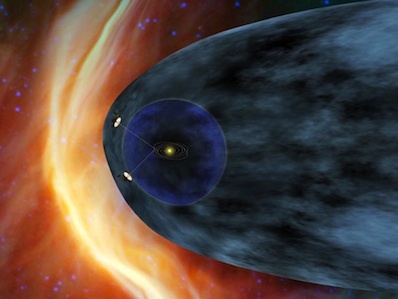 High-energy electrons from interstellar space are also leaking into the heliosphere, Stone said. 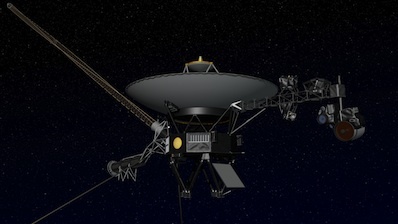 Voyager 1 is now stationed 11 billion miles from the sun. "What we're talking about today with all these new developements is simply one more chapter in a scientific inquiry that began over 100 years ago," said Eugene Parker, professor emeritus of physics at the University of Chicago. Looking for signs that the probe has crossed over the heliopause and left the solar system, scientists are closely watching data from Voyager 1's low-energy charged particle counter and magnetic field, cosmic ray and plasma wave instruments. The twin Voyager 2 probe is about 2 billion miles behind Voyager 1, but it's exploring the southern hemisphere of the heliosphere. Voyager 1 is flying up and out relative to the sun. The spacecraft have enough power to continue scientific investigations until approximately 2020, according to Stone. The probes could remain functional until around 2025. Stone said he expects the magnetic field to switch from an east-west to a north-south orientation. Evidence should also show up from more intense low-energy galactic cosmic radiation and reduced intensity of charged particles originating from the sun. "I think it's reasonable to think it could only be a matter of months or a matter of several years before we cross this region," Stone said. "But no spacecraft has ever been there before and we continue to find our models need to be improved as we learn more about the complex interaction between the solar wind and the interstellar wind." Traveling a billion miles every three years, the Voyager probes won't reach the vicinity of another star for another 40,000 years. Both missions launched on Titan-Centaur rockets in 1977. Voyager 2 completed a tour of the outer solar system, flying by Jupiter, Saturn, Uranus and Neptune before heading toward interstellar space. Voyager 1 studied Jupiter and Saturn in 1979 and 1980. "To me, it's been constant [discovery]," Parker said. "I hold my breath as to what's going to happen next."